I want to be the teacher that would have inspired my father to stay in school. My father is the smartest person I know, but he did not “officially” graduate high school. He received his GED and then went to serve our country in the Air Force. I am so proud of my dad. He has built multiple companies from the ground up, and is doing well. But, he has had to work extremely hard through life, and I wonder what his life would have been like if he had graduated from high school and attended college. Well, I guess I wouldn’t have been born because he met my mom while stationed at an Air Force base in Omaha, Nebraska, so maybe it all did work out for the best. However, I think we must allow our students the opportunity to dabble in job searching. Now is the time before they make decisions that can impact their lives in major ways negatively or positively. Sure, our fabulous guidance counselor comes in and talks about job opportunities, but what if we affirmed the importance of finding jobs that may interest them. The time is now to get your students thinking about their future. My class started thinking about their future the day I showed them the Kid President video, and maybe even sooner. We have, “blogged for a purpose” and now it is time to actually see what kind of jobs our interests match up to in the real world. Since it is after PASS this is a great time to do some career research. 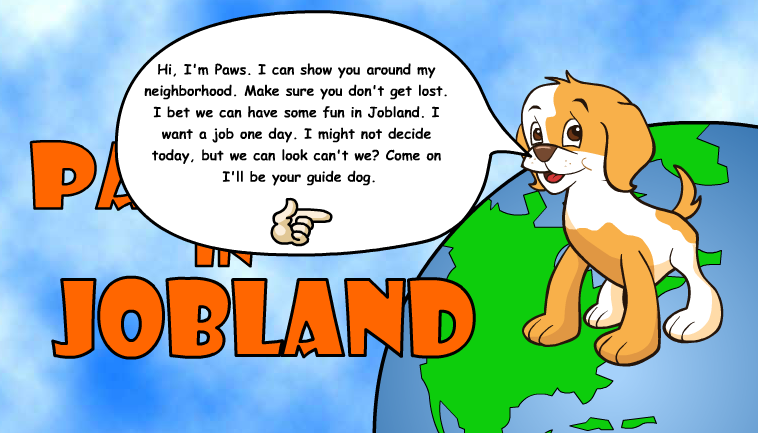 While scouring the internet one weekend I came across Jobs in Pawland, an extremely user friendly program that allows students to use the “Job Finder” to highlight career clusters that may interest them. So many quality conversations come out of a two week study on optional career paths and colleges. I have even had parents come back to me the following year and say, “My child loved when you went job and college searching. He said it was the best thing he was able to do last year.” What if my dad had been in my class? What if he had found out he had strength in the business field earlier? Or even in 4th grade? We should not encourage our students to only survive in the world, but to thrive in the world and make it a better place! You can download the outlines I have during our study of careers below.